Houghton Mifflin Harcourt, 9781328525772, 240pp. 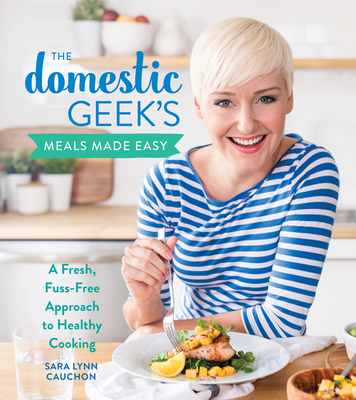 Since launching her YouTube channel, The Domestic Geek, in April 2014, SARA LYNN CAUCHON has earned more than 1.3 million dedicated subscribers who appreciate her fresh, fuss-free approach to healthy cooking. In that time she’s shared more than 3,000 original, mouth-watering recipes and 450 videos, as well as countless tips and tricks for making life at home easier. Sara Lynn is also an established host/producer/director who has more than a decade of broadcast experience. She has hosted a number of television programs including Diva On A Dime and the award-nominated HGTV’s Rooms That Rock. An experienced guest expert, Sara Lynn has made dozens of appearances on hit daytime television shows such as Dr. Oz. Her work has been featured in major publications like Huffington Post, Eat This Not That,and Today’s Parent magazine. She lives in Toronto.